Don't settle for less than what God can do. We often face situations in life that are hard. Whether it be a job loss, a difficult marriage, or problems with the kids-harsh storms come, and we can quickly feel overwhelmed, even desperate. Using examples from her own life and those of biblical characters, international speaker and teacher Charlotte Gambill offers that God is more than just a little bit of help, he's all the help; we need. 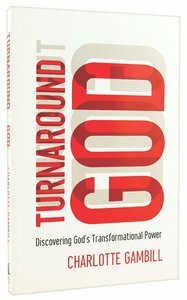 It's time for us to fully understand that there is nothing that God can't turn around! Charlotte Gambill is an international speaker and author best known for her practical and passionate application of God s word. Her messages of life and purpose are rallying a generation to embrace the broken and become ambassadors of hope. Charlotte and her husband, Steve, lead Life Church in England. They have two children, Hope Cherish and Noah Brave.